This blog is for those of you who have some experience using Adobe Illustrator and are looking to learn more about how to more efficiently use this design tool. I love Adobe Illustrator, and it's my program of choice for most of my projects at TIS. My first experience using Illustrator was back in a high school Graphic Design 1 class, on—dare I say it—a PC! I remember the first time I opened the program like it was yesterday. When I saw the Birth of Venus illustration on the loading screen, I thought, wow, this technology is fancy. Fast forward 10 years later, and I can hardly believe how much this program has improved and grown to change the face of graphic design. While I do use InDesign for multi-page documents and interactive PDFs due to its advantages for these type of projects, Illustrator has made many improvements that also include some InDesign feautres. However, the main reason I love Illustrator is the freedom of Artboard placement and getting to use the whole canvas space any way I like. 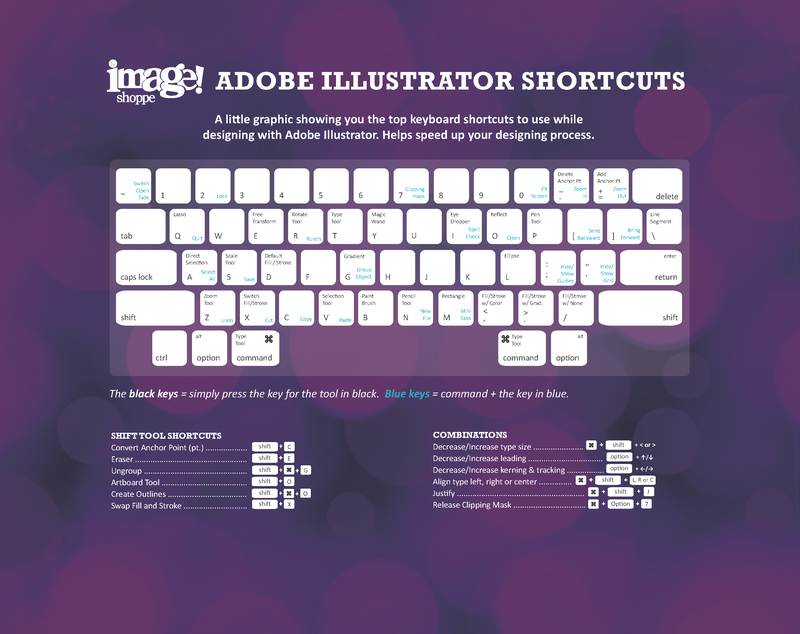 We’ve also created this nifty infographic that shows you more keyboard shortcuts (for Mac versions only). Click the image below to open up a larger image in a new tab. Artboards are the stages of your artwork—where your design shines—but you can still keep all your important stuff behind the curtains. Basically, an artboard is the area of your Illustrator screen that will show up on a finalized document. Anything outside the artboard will not show up on a PDF or any other way you save out a file. You can adjust its size, and include up to 100 different artboards in one Illustrator file—although it's best to keep artboards to a minimum. You also can save artboards individually if you have different sizes you’re working with or a front and back of a particular piece. I use Illustrator for any printed pieces that have a front and back like postcards, business cards, brochures, etc. I rarely use layers, unless I’m working with a dieline. Instead, I group or lock elements that I don’t want to move. I like my design elements in the same layer because it saves the hassle of having to find and move pieces to different layers. This isn't a universal preference, so do what works best for you. Another benefit for multiple artboards is trying out different designs rapidly. You can copy an artboard and then tweak the design to create a new composition. In your Artboards Window (View > Artboards), you can also change the order of your artboards, so they will save out in that order as pages in a PDF. If an Artboard is a stage, then the Clipping Mask is the masked actor. Essentially, they are images, shapes or text that are bound in a shape, hiding anything that’s outside of the boundary line. For example, clipping masks are what you use if you want to crop an image into a circle. But they can do much more, like crop out part of an image without having to do all of the Photoshop work. Clipping masks also contain all of the content as a group. When you double click on a clipping mask, it isolates the grouping, and you’ll be able to move around the elements within that clipped mask. Create a shape that you want to be the boundaries of your mask, and turn it into an outline. Place whatever you want within the clipping mask behind the outlined shape. Select all of those items at the same time then Object > Clipping Mask > Make, or Command + 7. To release all of these contents, Object > Clipping Mask > Release, or Command + Alt + 7. Click here for more info on clipping masks. One of my very first projects in a high school class was learning how to use the pen tool by tracing the whole Monopoly board and turning it into a vector. I will say it took me way longer to do than it takes to play a game of Monopoly. But the pen tool is a valuable one once you get the hang of it. I would equate it to a set designer, if we continue with my theatre analogy. It’s one of the main building blocks of Illustrator, and how vectors are born. The Pen Tool can be a little confusing when starting out, but don’t give up, and keep practicing! Start out by tracing simple shapes. *Tip: When drawing arced objects, the fewer the points, the smoother and neater the line. You will want to work your bezier lines to meet the paths you need versus adding more points. This great Comprehensive Guide with a practice Illustrator file download will also come in handy. Align is like the chiropractor for your graphics. Align centers or right/left aligns objects on a page. It also distributes objects evenly to your artboard or aligns to a key object that you select instead of the artboard. It might not be in your workspace, so click Window > Align to open it up. Here's another tutorial that shows you how easy it is. This tool is what I like to call the donut maker. Sadly, it doesn’t provide you tasty baked treats, but it does take the “hole” out of any circle. Basically, PathFinder allows you to intersect, divide, trim, unite, and merge shapes or other vectors. Here's a great comprehensive visual guide to Pathfinder. Smart Guides and Rulers are the architects of the design world. They help you establish the almighty grid and make sure you are lined up properly. At first, I hated the new addition of Smart Guides (the pink text that pops up when you move around objects in Illustrator). But, I have come to appreciate how helpful this tool is. (View > Smart Guides or Command + U). When dragging objects, the pink Smart Guides will pop up and tell you if you’re aligned to certain objects or if you are equidistant from another object. It will also tell you if you’re rolling over a path or an anchor if you need to pick up a point to move it. Rulers allow you to develop your own grid (View > Rulers > Show Rulers or Command + R). This will pop up the rulers on the top and left of your screen. Right clicking on the rulers can change the unit of measurement as well. With the rulers up, you can click and drag the ruler from either the top or left to create horizontal and vertical cyan lines, or guides. Pull guides to create a beautiful grid that will ensure your text and images line up perfectly. If you’re not seeing the lines go to View > Guides > Show Guides (Command + ; ) and View > Guides > Lock Guides in order to move them around or lock them (Command + Alt + ; ). If you don’t see your favorite Tip or Tool, please share yours with us in the comments below!